Sometimes the only way to overome dizziness and nausea is to ignore it. Use distraction therapy. that can mean watching TV, listening to music, meditating, doing something else you love. At 10 pm last night Scott and I had only intended to take a short stroll to the end of the terrace. We wound up in the lobby watching Oksana play ping pong. Scott gave her a few pointers on how to improve her game by holding the paddle angled properly. He’s going to give her some more lessons later. A young whippersnapper friend asked Scott to play. Scott won both games. Our young friend is a good player, too. The exertion energized Scott. It also gave us both 4.5 hours of blissful sleep. This entry was posted in Uncategorized and tagged exercising when sick, Going to Goa Blog, india, ping pong. Table tennis, Scott Morgan, traveling with cancer. Bookmark the permalink. Beautiful serene blue color coordination ! 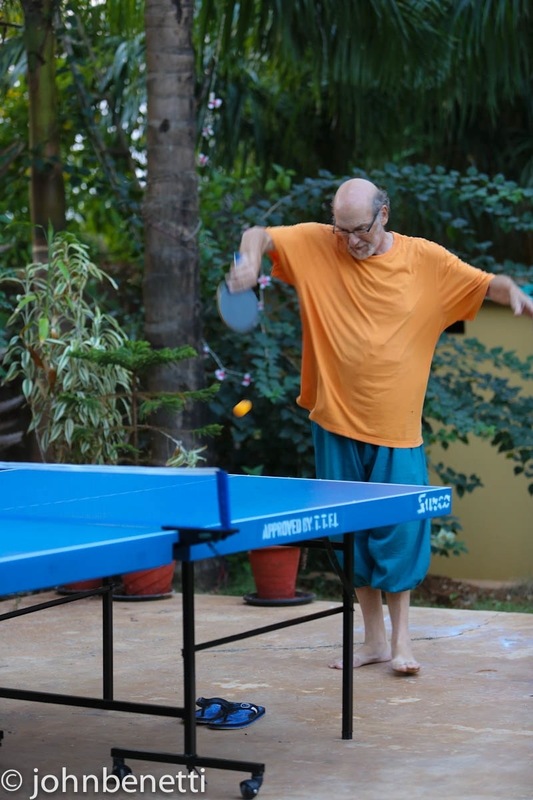 Like Idesign said, the vacated flip-flops matching his shorts, the table and the paddle are azure companions, while the blurred pp ball looks like it was birthed from Scott’s tangerine shirt. Very groovy. We had a ping pong table on our sleeping porch in Greater Kailash. It was great entertainment and largely took the place of TV for us. It makes me smile to see pictures of you playing!